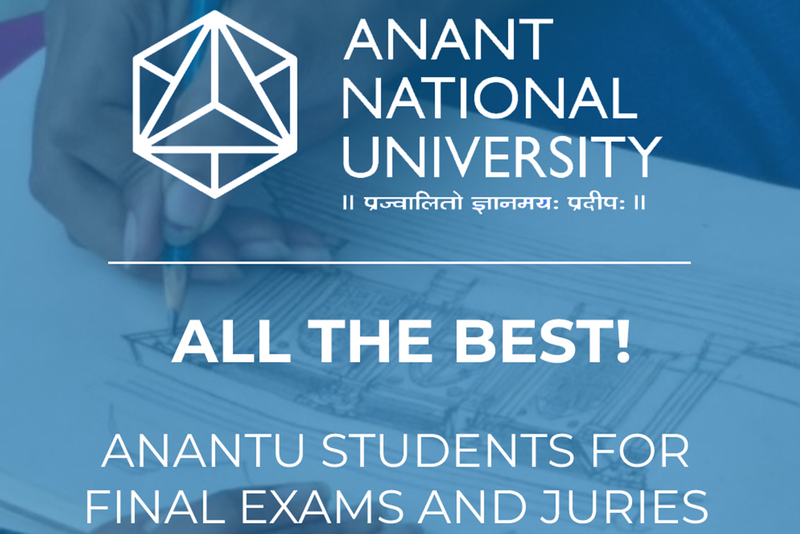 The editorial team wishes all students of AnantU all the best for their end-semester exams and juries. 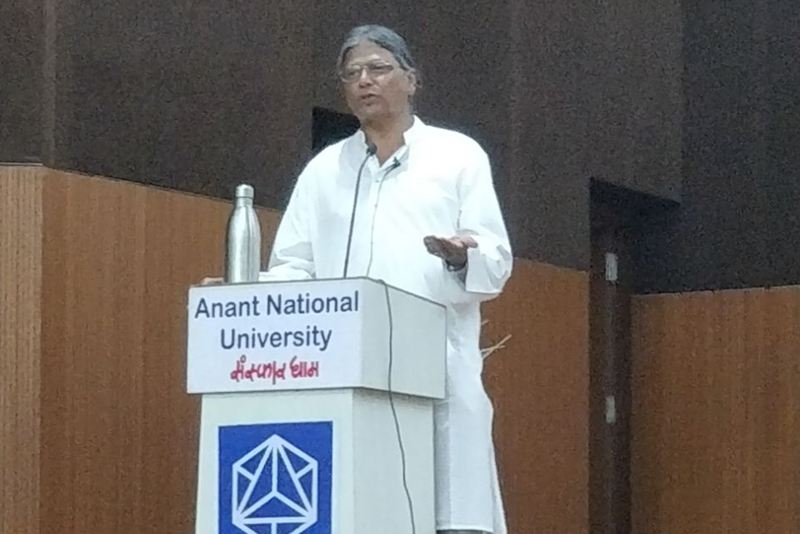 Anant National University organised a public lecture by Prof. Amareswar Galla, Executive Director, International Institute for the Inclusive Museum, Australia, and Chief Curator, Amravathi Heritage Town A.P. India, at its auditorium on April 19,2018. Prof. Galla spoke with great enthusiasm on how intangible heritage, like performing arts, traditional craftsmanship, storytelling, and ethnic practices, have shaped the culture of our country and its policies. He educated the audience on the importance of safeguarding living heritage systems and steps we, as individuals, should take towards it. Prof. Galla has worked extensively for the betterment and preservation of living culture globally. His efforts continue to inspire young citizens around the world to take up cultural heritage as a cause. 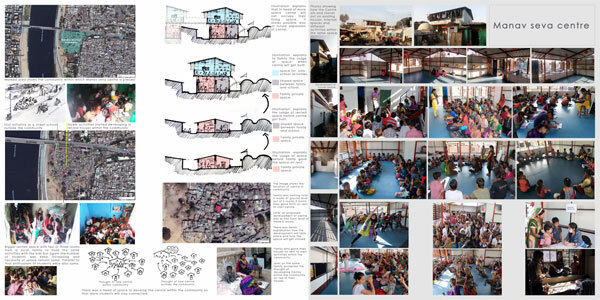 On April 20, 2018, Anant Fellow, Harshil Parekh, presented his work to the Pritzker Architecture Prize winner, Ar. 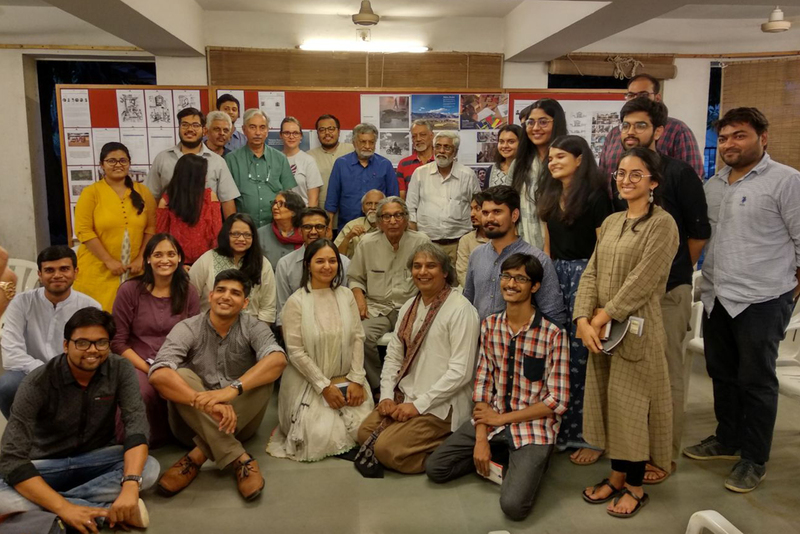 B.V. Doshi as a part of the DWK HUB at CEPT University. "Doshi We Know" is a School of Architecture, CEPT, alumnus body formed in 1997 with an intent to set up a scholarship fund for young architecture graduate with unique aspirations towards architecture allied practices. The philosophy of the group is based on BV Doshi's philosophy of learning beyond education. We are also sending good wishes to students who have applied for courses at AnantU as freshers. Entrance test results will be announced shortly. 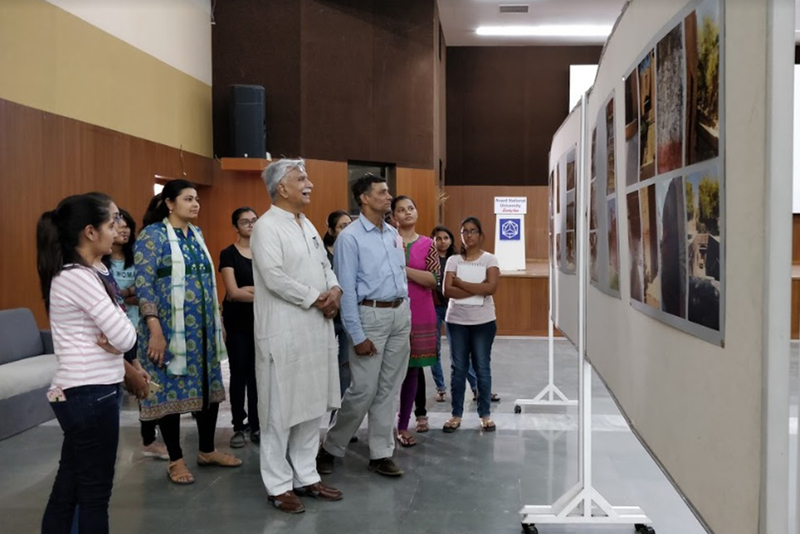 First year Design students exhibited over 400 spellbinding photographs clicked by them at various locations in Ahmedabad over a course of 4 months. These photographs captured the essence of the city in an aesthetically appealing manner while still satisfying technical aspects like light and shadow, angles and perspectives. 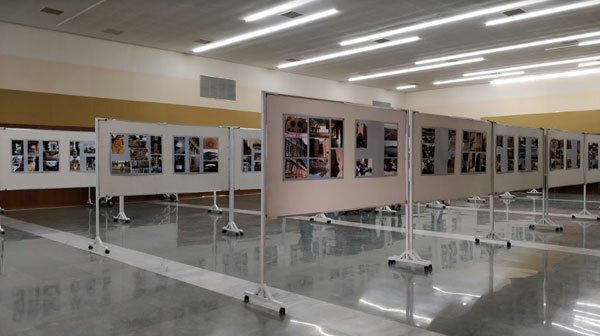 The exhibit was organised at AnantU auditorium on April 16 and 17 as a part of their Photography course evaluation. 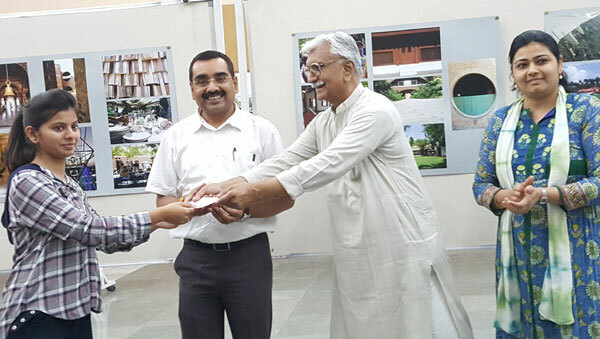 Senior faculty Mr. Dhalwadi, along with course faculty, Mahendra Nikam, and Vice Principal of School of Design, Chaitali Sheth, recognised Riddhi Sanghvi and Parin Padit as best photographers for their outstanding clicks. 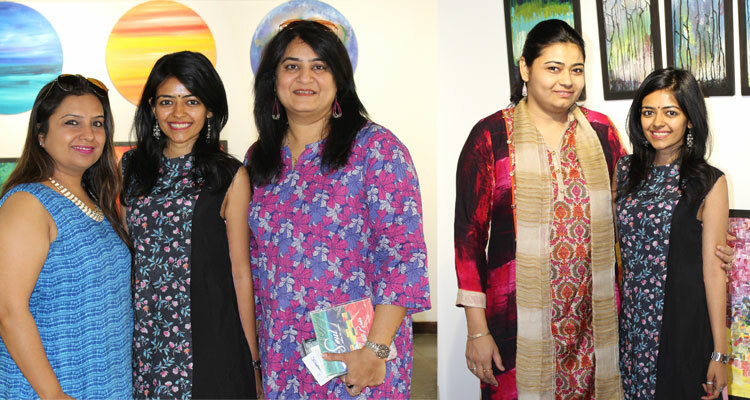 School of Design faculty, Ms. Nirali Parekh, exhibited her paintings at the Solo Art Exhibition, Reflection, on April 15, 2018. 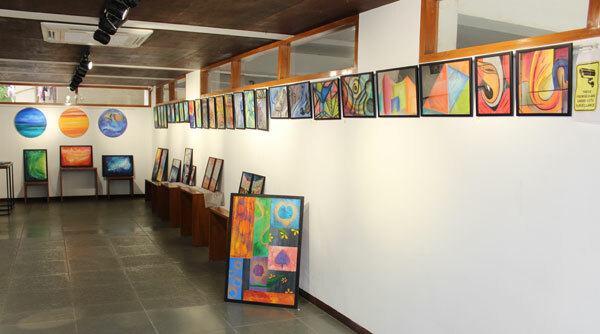 Based on the theme of discovering unique expression of colours, her abstract paintings were inspired from ideas of colour explosions, abstraction of elements and Warli art form. She used a varied range of techniques and tools to create her beautiful and vibrant pieces. Her paintings were made with acrylic paints, charcoal, pen and ink, and glass colours. 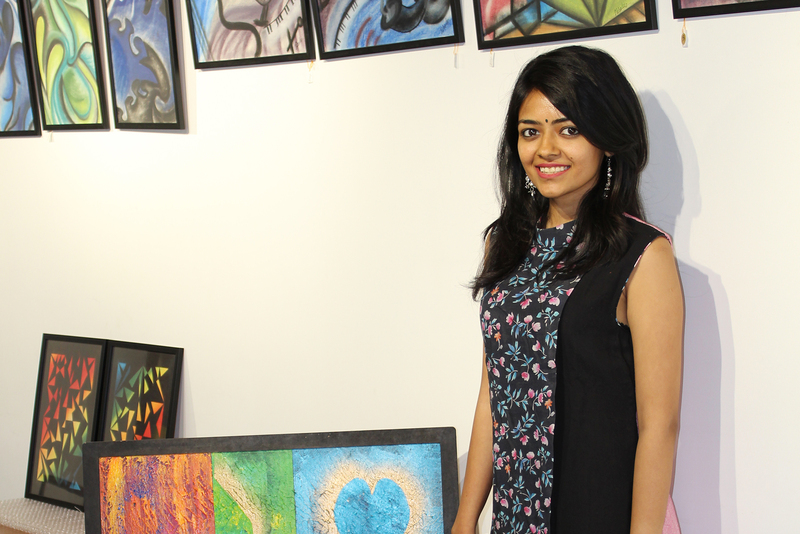 When asked about her creative expressions in the form of paintings, Ms. Parekh said, "I don't draw the things I see or dream, I paint the things I feel." 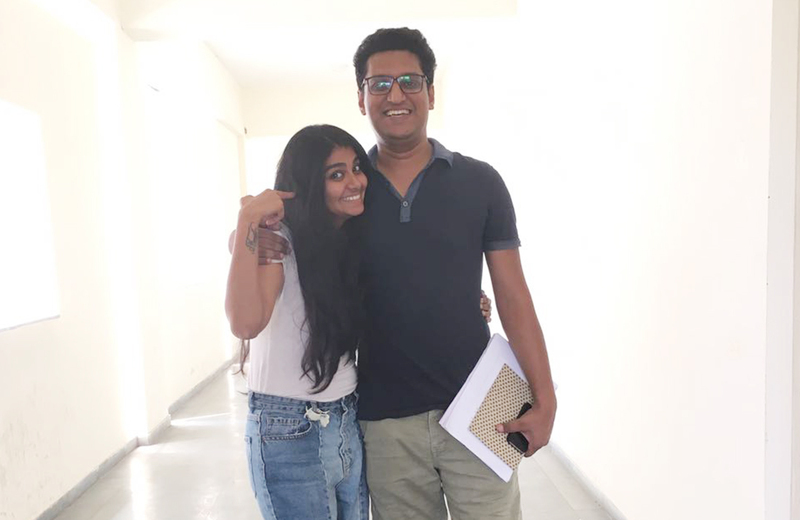 Anant Fellows, Jinal Doshi and Joseph Rajini Asir, discovered their passion from a classroom assignment and started their own creative venture, Oji. During one of their Anant Fellowship lectures, the duo identified there was a lack of personal reminders at individuals' workspaces and that an intervention was required for it. This is how Oji was born. 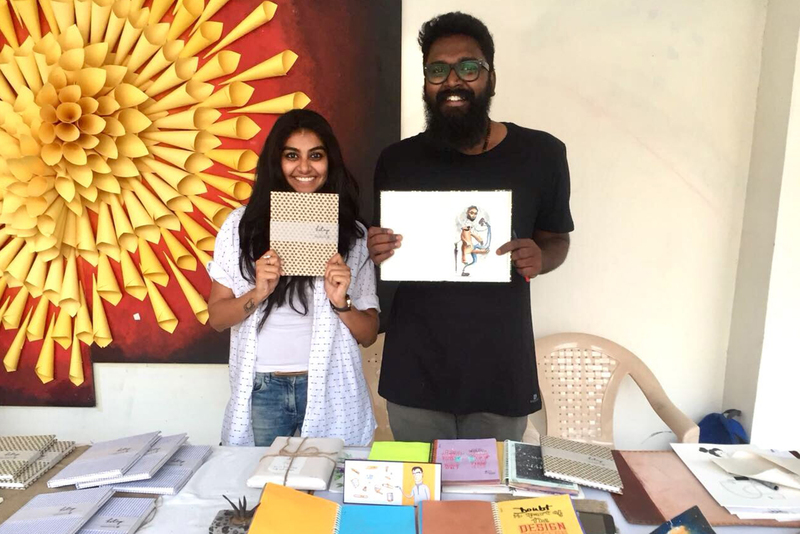 Oji stories is a small initiative where Jinal and Joseph make conversation based art products that revolve around daily objects and desk stationery. These entrepreneurial visual artists and practicing strategic designers wanted to build a system that provides a personal experience of having one's thoughts brought out into art works through metaphor elicitation and careful empathy. The Oji journey began with just mugs and art prints, but has now evolved to wide range of hand crafted writing medium and other supplies. True to their Anant Fellowship values, their books are organic and sustainable, made from recycled cotton and Khadi. A pet plant called Mitr has been curated by Oji that grows amidst concrete and floats in water. As an overall brand, Oji speaks to its customers like an old friend, and Jinal and Joseph continually build strong relationships with everyone they interact with to bring out the individual's inherent essence in their products. 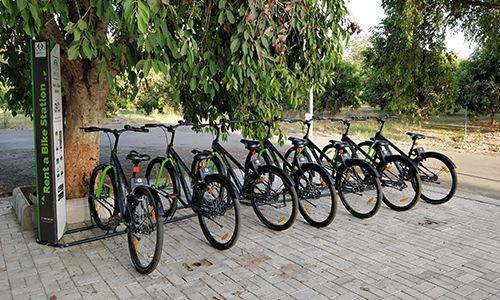 Anant Fellows, Anurup, Tanvi and Archit, in collaboration with MyByk, have started a cycle sharing service in AnantU campus as a part of their Live Action Project. With the intention to encourage the AnantU community to be closer to nature at our expansive campus and build a sense of belongingness towards the space, the Antar team kickstarted this environmental friendly initiative in April, 2018. Students, faculty and staff can simply download the MyByk app and rent the cycle for as long as they want. The initiative has brought AnantU one step closer to its ambition of becoming a world leader in sustainable solutions. Jinal and Joseph, Anant Fellows, facilitated a workshop on sustainable collaborative practices for AnantU students at the campus. With a motto to explore, engage and exhibit, this workshop prepared young individuals to practice collaboration inwards and outwards, with self and others. Participants were educated on how sustainable collaborative awareness happens in three stages: knowing the self, understanding the other and efficiently translating ideas. The process followed personal conversations in confidentiality, elicited metaphors through visuals and self-narratives and interpolated the past experiences to extrapolate possible outcomes. 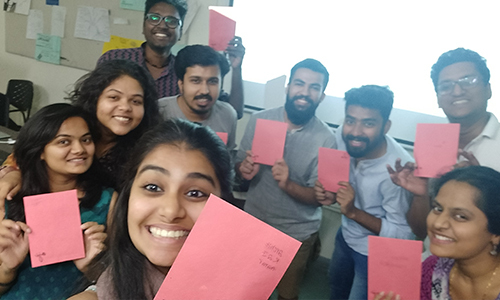 The workshop taught students a few lessons on communication, sharing and leadership, while to its facilitators, it reinforced their belief on having non-judgmental conversations to bring out the most authentic selves of people. Students of School of Design participated in glass workshop on April 16 and 17. 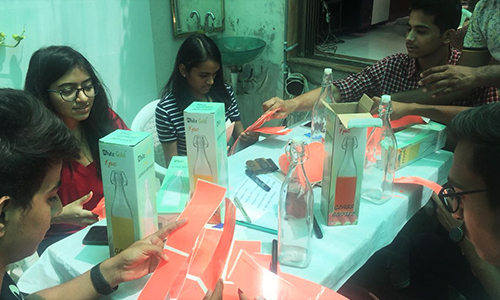 They learnt basics of surface etching, carving, shading with sand blasting on different glasses, glass painting and more such techniques to creatively use glass in various design forms. 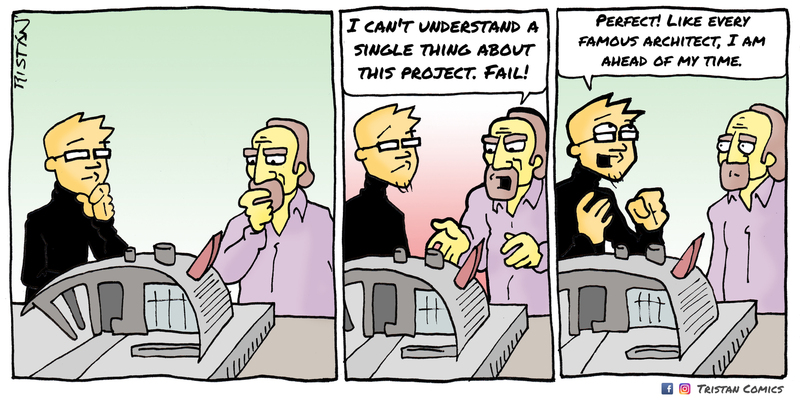 Comicale is a visual narrative platform with the intention to put a smile on people's faces. The core purpose of this initiative is to breathe life into inanimate objects by imagining them as almost imperfect human beings. Relatable content has already attracted Comicalers to unique storylines and experiences. In a world full of greys, Comic brings in her balance and rejuvenating spirit while Ale fills the space with his happiness and optimism. 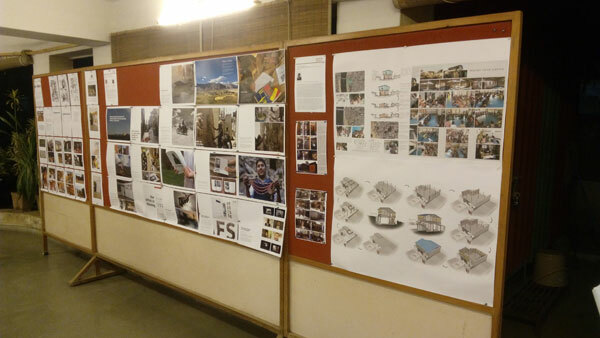 Comicale is a collaborative effort between Rutvi Ashar and Archit Thapar who are currently pursuing the Anant Fellowship for Built Environment at AnantU. Faculty Development Programme on 'Teaching and Leadership' was conducted by Prof. Indira Parikh, Founder and President, FLAME University, for faculty of Anant National University on April 2-3, 2018. Through this programme, Prof. Parikh helped faculty members become aware of the changing classroom trends, better teaching methodologies and their personal strengths and areas of improvement. The 2-days workshop proved to be extremely helpful and insightful to all participants. Baisakhi festival falls on 14-15 th April every year according to English calendar. It is the first day of Baishak month which marks the beginning of the New Year. On this day the sun changes its position and marks the entry into the Aries Constellation. In the state of Punjab, Sikh population celebrates it with a lot of enthusiasm and gaiety. For them, Baisakhi Festival has tremendous religious significance as it was on a Baisakhi Day in 1699, that Guru Gobind Singh, the tenth Sikh Guru laid the foundation of Panth Khalsa-the Order of the Pure Ones. Similarly, for the large farming community of Punjab, it marks the time for harvest of Rabi crops and they celebrate the day by performing joyful Bhangra and Gidda dance. Baishaki festival coincides with different other festivals in different parts of our country such as Puthandu, the Tamil New year, Bikhu or Bikhauti in the Kumaon region of Uttarakhand, Bisu - Tulu New Year, Rongali Bihu in Assam, Edmyaar 1 (Bisu Changrandi) - Kpdava New Year, Maha Vishuva Sankranti (or Pana Sankranti) in Odisha, Jur Shital (New Year) in Bihar, Nobo Borsho or Pohela Boishakh in Bengal, Tripura, Sikkim, Nepal and Bangladesh, Navreh in Kashmir, Vishu in Kerala. 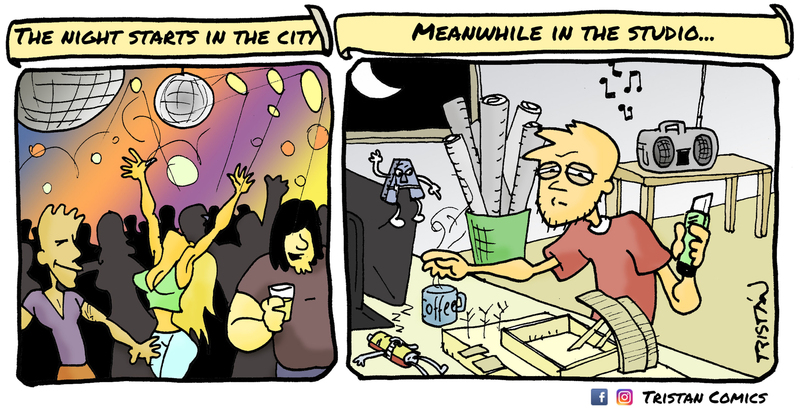 It also marks as Sinhalese New Year in Sri- Lanka, and Songkran in Thailand. 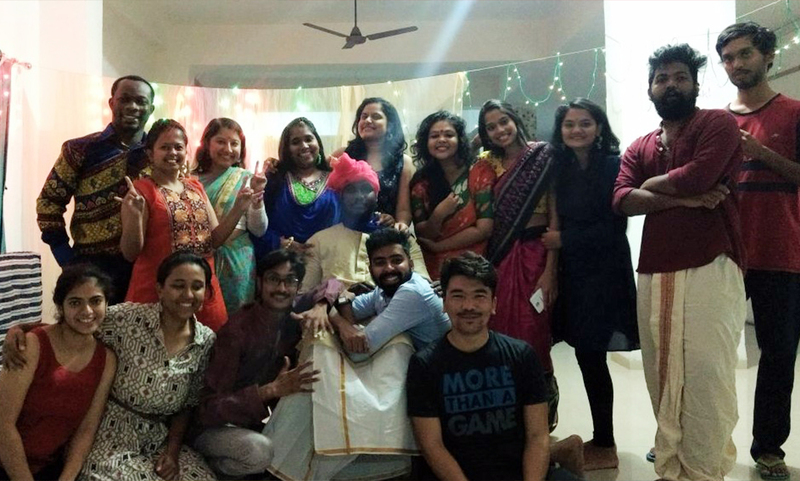 On this auspicious occasion i.e on 14th April, 2018, 8 p.m. onwards, Events Committee of Anant Fellowship had organized a celebratory dinner followed by DJ night at the common area in Anant Fellowship Residence. The main motive behind the celebration was to strengthen the bond among the Fellows and to relax from their hectic schedules. The event was made more memorable by having a traditional dress code for everyone and decorating the entire place with fairy lights. 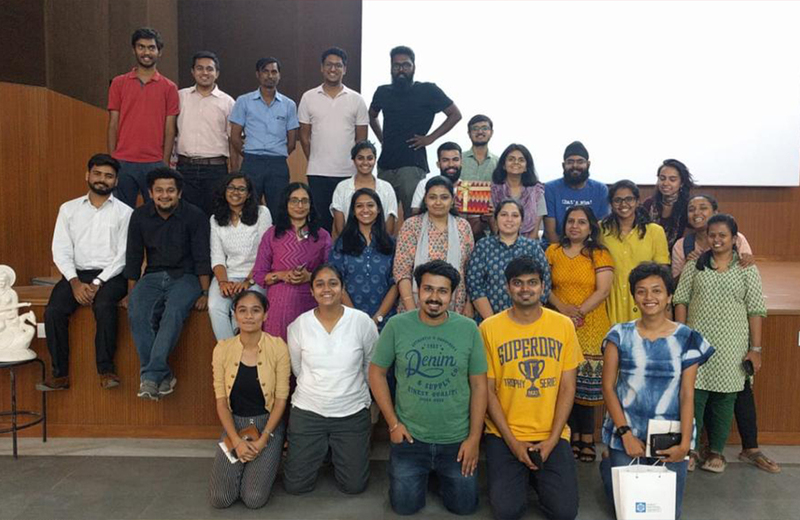 Every month, the Film Club @ AnantU organises a community screening in campus to promote exchange of ideas and introduction of new concepts among members. On April 12, the ethnographic film 'A Brief Encounter with the Kunds of Benaras' was screened in the presence of its director, Mr. RohitLahoti. The event began with an opening teaser of Travelling without Moving, followed by the film screening. Post screening, a contest titled 'First Frame: Collaborative Story Telling', was conducted. Participants had to form teams and present a creative piece on the documentary. Winners were chosen by a judging panel and were awarded confectionery hampers. Listening Circle is an initiative designed by Mr. Sushanta Banerjee, Director of Sumedhas, the Academy for Human Context and facilitated by Mrs.Chandni Patel at AnantU campus in co-ordination with Anant Fellows - AayushMakharia and JinalDoshi. The initiative provides the AnantU community a platform to make themselves heard when no one else is listening. This noble venture is meant to let people express themselves without being judged, advised or debated on. Participants express their core self, thoughts and feelings which awakens them and helps them become truly aware of themselves. This can help them make better choices and wiser decisions. The listening circle happens on a bi-weekly basis and the forum is open to all in groups of seven.